The Royal Canadian Air Force (RCAF) is pleased to announce the appointment of Captain Brian Kilroy as the pilot for the 2019 CF-18 Demonstration Team. Captain Kilroy will wow audiences around Canada during the 2019 air show season, flying his specially-painted CF-18 Hornet commemorating the RCAF’s pathway to the stars and the 70th anniversary of the North Atlantic Treaty Organization (NATO). Born in Grande Prairie, Alberta Captain Kilroy spent his childhood in Stony Plain, Alberta, and graduated from the University of Alberta with a degree in chemical engineering. The son of an RCMP officer, he was strongly supported to pursue his aviation dreams by his mother, who also shared his love for aviation. He attended numerous airshows throughout his childhood where he even had the chance to see the CF-18 Demonstration Team perform, which further inspired him to follow his dream of becoming a fighter pilot. Captain Kilroy was a member the Royal Canadian Air Cadets in Stony Plain before deciding to pursue his dream of flying and joining the RCAF in 2006. He was later given the opportunity to attend the Euro NATO Joint Jet Pilot Training program in Witchita Falls, Texas, where he went on to fulfill his lifelong dream of receiving his RCAF pilot’s wings. Following flight training, he was posted to 409 Tactical Fighter Squadron at 4 Wing Cold Lake, Alberta, as an operational fighter pilot in 2013. Captain Kilroy has actively served throughout Canada on the Hornet in support of NORAD and has deployed numerous times on international NATO and Canadian Armed Forces missions. 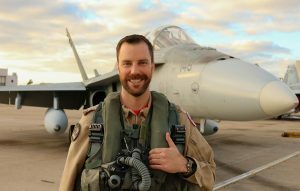 Today, Captain Kilroy is a four-ship lead and qualified Electronic Warfare Instructor with 410 Tactical Fighter (Operational Training) Squadron, using his combat and operational experience to train the next generation of CF-18 pilots. Based on the RCAF’s motto Sic Itur Ad Astra (Latin for “such is the pathway to the stars”), the 2019 CF-18 Demonstration Team will celebrate the history of the RCAF, recognize the innovative and driven Canadians who have led the charge for change and stand ready to inspire a new generation to take up the flame of innovation and help shape the RCAF’s pathway to the stars. The 2019 season also provides an opportunity to highlight the RCAF’s operational role within NATO, a cornerstone of Canada’s international security policy, as it celebrates its 70th anniversary. The 2019 schedule will see the team visit 15 different show sites across Canada, as well as take part in the Parliament Hill flypast in Ottawa on Canada Day. The 2019 CF-18 Demonstration Team is looking forward to thrilling audiences across Canada this summer and demonstrating the RCAF’s capabilities to Canadians.